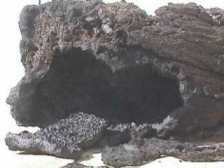 During the month of october 2000, a scientific co-operative portuguese-french investigation was carried out on the submarine volcanoes called Serreta and Don Joao de Castro in the Azores archipelago. This preliminary study has been leaded within a co-operation between the European Volcanological Society (SVE), University of Chambery and ( CRV-CNRS-INSU) and the Geothermal and Volcano Observatory of Azores ( OVGA). Main purpose of this investigation was to record acoustic signals from these volcanoes and to observe, with a small submarine engines, type, morphologie and distribution of the recent pillows lava of the Serreta volcano. This campaign was funded by the Regional Government of Azores (Scientific and Technologic Dpt. ), The Unity of investigation ELMAS of the Aveiro University, the french Embassy of Lisbonne ( Science and Technology Dpt) and OVGA Team including Michel Halbwachs (University of Chambéry), Henry Gaudru ( SVE ), Victor Hugo Forjaz, Zilda França, Francisco Rocha, Luis Menedez, Jose Manuel Medeiros de l'OVGA and Raymond Fradin et Roman Buniak of the french Speleologic Society of Fontaine de Vaucluse. On the 18 th december 1998, fishermen from Terceira island advised local navy authorities that columns of white " smoke " steam were rising from the ocean at a point around 9 km NW the Serreta lighthouse . Local depths was around 500 m and was close a small bank ( Baixa da Serreta) where a submarine eruption took place on June 1867. 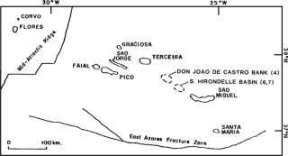 Most part of the Azorean oceanic eruptions persist around 1-2 weeks and they were of surtseyan type with periods of strong degasing (Capelinhos volcano, at Faial, is a well know exception of around 13 months that has finished as a strombolian cone connected to the main island). The present volcano (that we call Serreta Oceanic Volcano) was still active in March 2000 along NE-SW and NW-SE faults, affecting an area of 2 km length x 0.6 km wide around several vents located 8.5 km NW Serreta lighthouse. Volcanic activity has been discontinuous with periods of small and calm bubbles emissions alternating with periods of abundant pyroclastic and buoyant very glassy pillow lavas blocks. This persistent emission of floating strongly vesicular pillows ( filled by fluid lava sometimes exploding when arriving to surface and plunging after several minutes) is a very unusual event. 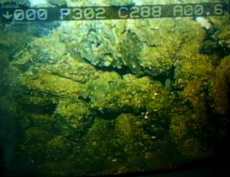 Don João de Castro Bank is a large submarine volcano that rises to within 14 m of the sea surface roughly halfway between Terceira and San Miguel Islands. 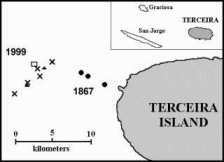 A submarine eruption (with a Volcanic Explosivity Index of 3) during December 1720 produced an ephemeral island that attained a length of 1.5 km and an altitude of about 250 m before it was eroded beneath the sea surface two years later. The submarine volcano has an impressive fumarole field and remains seismically active. The area was charted in 1941. 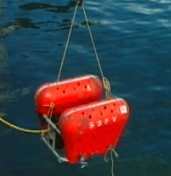 This acoustic survey campaign was the first carried out on the submarine volcanoes in the audiometric and ultrasonic bands. Hydro-acoustic technic and preliminary results.